After my husband came back from Afghanistan and got his Vulcan 900, I was joking that I wanted a bike, too. Low and behold, he traded a few things in his shop for a Virago 700. I drove it once, went 7 feet and did a full throttle spin-out. After he picked the bike off me, we both realized that it was too much for me to handle. We went to the dealer where we bought his Vulcan, and talked to them about a bike for me. Since I am 5'2" and had never driven a bike more than 7 feet before, we decided on a Yamaha TTR125LE dirt bike. Great little bike, but after months of doing circles in our yard, I needed something that would go down gravel easily and be street legal. We went back to the dealer after I checked the specs on 5 bikes. I fell in love with the XT250, but the seat height was higher than the specs stated. The guys at the bike shop went out of their way to have a lowering kit made for me. That brought it down to 30 inches. I have successfully put 20 miles on it with no problems! I would have more miles if it weren't for the beautiful weather in North Dakota. I highly recommend the XT250 to anyone starting out. It handles great on gravel, in mud and snow, is lightweight, starts even when it is below 30 degrees out, and is very forgiving when it comes to shifting. I like the digital multi-function display, locking gas cap, and ignition circuit cut-off switch. I am adding a luggage rack and bag. As for long trips, I will still be a passenger. What a great way to spend time with my hubby! We are going on a cross-country trip later this month, and then he is off to Kosovo for a year. Yet another reason to have a bike that I can handle! When he comes back, we will go shopping again. By then I should be ready for a cruiser. I'm thinking Harley Nightster or Suzuki Boulevard S40... He's thinking Harley Streetglide. We can send men to the moon in the 1960's but we can't make a low seat height enduro? The XT250 is a great bike unless you're on your tiptoes and stop the bike on pavement that drains off right or left...If you put your foot down on the low side the realities of physics and the lever principle are going to dump you hard and probably pour fuel all over you and the bike. You are talking hundreds of pounds of force with momentum coming over on you the CG of the xt250. Add a gust of wind going in the same direction and you have a real problem. So really? We all don't need to go to Dakar on our enduros...Can't someone make a lower dual sport? How to change seat height of XT250. I have ordered the XT250. I am concerned about the seat height. My other bike is a Virago 750 which is low. How can I lower the height of the XT250. Any help will be greatly appreciated. I just purchased a new 2010 xt 250 and I love it. I ride around town and not sure I would like being on the major highway for long periods of time. It has great acceleration and keeps up with everyone I ride with. They all ride street bikes. So far so good. Hi, here a a couple of links that might be of help. even though they don't have the lowering link for the XT, it gives an idea on what needs to be done. has accessories for the XT. It's scary being on any bike on LA freeways during rush hour but with some discretion you can do it. I ride mine to work nearly every day and have 4,000 miles doing it. My XT250 does fine under my buck thirty five weight. At 70mph I still have throttle to spare. I prefer it at 65mph because the bike seems a bit more solid there. At 70mph you start realizing it is a 300 pound bike. Sportbike riders will pull up next to you if they think you're female and flirt....while flying down the freeway. On the weekends the bike switches personalities when I switch from street gear to dirt gear and the bike chases KTMs. Bottom line is that I love this little bike. It's a pocket monster that will serve for years to come. I commented earlier about my interest in getting a lowering link made for my XT250. Just wondering if you got back from your travels and have any suggestions about where or how I could get it manufactured. I am really glad there are other women out there loving this bike and getting it lowered! If you are 5' tall, there is no way you are going to be able to lower it enough for your inseam. I still have to tippy-toe and I am 5'2". You should go to different dealers and sit on the bikes. I wanted to go for a bigger dirt bike, and the dealer flat out told me there was no way they could fit me on anything else. You may have to go with a 125 enduro style. The 125 is fun in the dirt and so much more fun since feet on the ground means better control. I'm thinking about buying this bike. The only problem that I have with it, It's to tall for me. I stand 5 feet tall. My inseam is 28 inches. My husband thinks it's the right bike for me. He wants me to go out with him. He just bought a KLX650. He loves his bike. I want to go out with him, but finding the right bike for me is not a easy one. I have had my bike for almost 6 months now and just hit 300 miles. I recently went looking for a bigger, shinier bike and realized I love my bike. I don't need something shiny to make me feel good riding. I just need the freedom of riding. 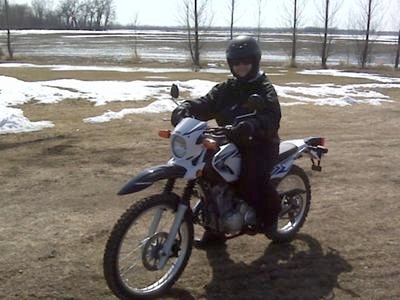 I also realized that I love dirt and have started using my TTR125 to do some local motocross tracks as well as a track around my yard (we have 10 acres of bumpy ground.) Guess some of us were meant to go slow and get dirty. I love riding on the back of my hubby's Vulcan for long trips. We did a 5450 mile road trip in April-May for 19 days and just did another 4 day trip that was 2550 miles. That was our last big ride for the year as he leaves for Kosovo in 12 days. As for me, I will hit the dirt and feel the air in my helmet as I go over hills and jumps. Just wanted to say, it isn't the size of a bike that matters, it is the way you feel when you ride it. I have had mine up to 70 mph for 15 miles with no problem. It rides just as smooth at a higher mph as it does at 45. I know it will go faster, but 70 is my comfort zone. The first time I did it, I felt like I was in 4th gear, but a quick flip of the foot let me know I was in 5th. I plan on doing a few longer runs with my husband. He has a Vulcan 900. There is a big difference when going from a dual-purpose to a cruiser, so I imagine it will take some practice on turns and stops with the dual-purpose. I love mine! My next bike will be an S40. That will be my cruiser. My wife currently rides a Kawasaki Vulcan 500; strictly a street cruiser. We are interested in getting her into to the dual-sport scene (I ride a 2008 KLR650). I am curious... how does the 2009 XT250 do at highway speeds, say 60-65mph? I am a bit concerned with the 5-speed transmission. We are not planning on doing any endurance rides with her on that type of bike. It would be mostly 150 mile or so rides to a favorite camping spot, including highway, 2 lane roads and dirt. Anyone with info? I did not have the bone made. My dealer had it manufactured and installed before I picked up the bike. They said they just took the original bone to a local welding shop to have the adjustment made. Glad to hear that you were successful in getting a lowering link made for your XT250. I am also 5'2" and would love to get more info about where you got yours fabricated. I went to that site, too. I printed it and took it to my dealer just to make sure it would work. He told me that since it is a Canadian part and my bike is USA, it might not fit.He even called the Yamaha parts guy that they deal with. He had never seen it. What a shame! I loved the look of the rack. Also found a windshield, but it is just in testing phase, so I am willing to wait on that. There is a company called TCI that makes aftermarket parts. I am thinking of trying them since they are US parts. They can always be sent back if they don't work. Thanks for the input. Glad to know I am not the only one looking for parts. The bone can be made at any welding shop. It needs to be 1/4 inch longer to decrease the height of the bike. Also try loosening the suspension. This was done for me at the dealer, but the directions for this should be in the manual. I have become comfortable with mine and I have a 29" inseam. Just need to decide which leg to lean in to more. I have put over 130 miles on mine and get more confident with each ride. I'm interested in buying and lowering the seat height. That bone piece I understand has to be made longer to get lower. I'm 5'4 and I think the 32 inch seat height would be too high. If at all please respond. And maybe even the length of the "bone" pieces. Thanks fellow b.c.er. I am currently on a road trip with my hubby, but as soon as we get home, I will get all the info for you. Ours was made at a welding shop in Grand Forks. It is a small bone that has to be remade. I will be back home the 17th of May. Do you think they could make another lowering kit? I need to lower the XT250 for my wife and would love info on lowering kits and who can supply them.